This entry was posted in Politics and tagged alcohol, Arlen Specter, copyright, DMCA, Republican, Tweets, typos, vaccinations on May 4, 2009 by Kelson. Trying Seesmic, Ticketmonster, DMCA Yourself! This entry was posted in Computers/Internet, Music, Politics and tagged copyright, DMCA, Tweets, Twhirl, Vienna Teng on April 8, 2009 by Kelson. 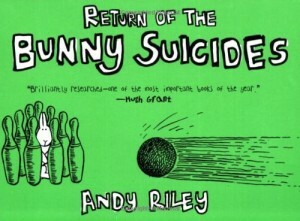 Looking at the list of “most popular” links on Del.icio.us, it seems someone has scanned the entire Book of Bunny Suicides and its sequel, both by Andy Riley. Good grief, people—you can pick up the book for $7.00 at any bookstore. I can understand posting a couple of excerpts, but from what I can tell, these people have scanned and posted the entire book. They haven’t even credited the source! 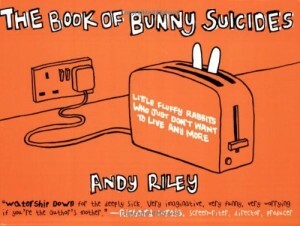 In the blog postings that show up on a “bunny suicides” search, most of them don’t even seem to know where the cartoons are from. Heck, even with pirated MP3s you usually know who sang the song. It always amazes me how rude people can be. This entry was posted in Annoyances, Comics and tagged Books, bunny, cartoons, copyright, DMCA, pirating, suicide on May 7, 2005 by Kelson. So Apple is ticked off at Real’s reverse-engineering to let people buy music from Real and play it on an iPod. Apple has threatened DMCA sanctions and all but promised to deliberately break it in the next software update. Excuse me? In general I like Apple, but their insistence on locking the iPod to iTunes and iTunes alone is short-sighted. When people hacked up a way to use an iPod on Windows, they first licensed the software, then wrote iTunes for Windows. iPod sales have tripled to the point where they may soon outsell Macintoshes. This could never have happened if Apple had kept the iPod Mac-specific. I’m reminded of the many times Microsoft has altered its file-sharing protocol to break compatibility with Samba, the package that allows Linux, BSD, and now Mac OS X to connect to Windows networks. The classic analogy is getting a car that can only run on certain roads. So someone’s found a way to let the iPod drive some different roads. But Apple still sells as many iPods. They might even sell more (as when it gained Windows compatibility). Why the accusations of hacking, why the legal threats, and why the determination to keep the iPod locked to their own roads? This entry was posted in Apple, Music and tagged car analogy, DMCA, DRM, iPod on July 30, 2004 by Kelson.